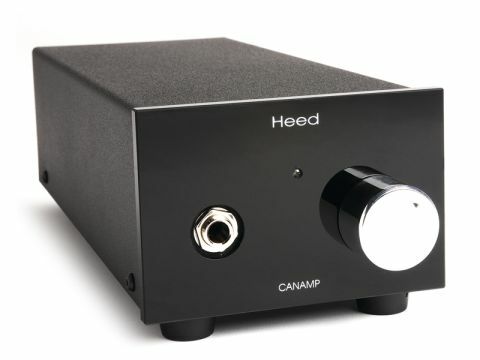 The Heed Can Amplifier unit is a little larger than many of its rivals, for the simple reason that it includes a mains transformer rather than using an external power supply. Wall-warts are easier to change if one moves to another country (but how often does one do that?) and reduce the potential for mains interference, but in reality the audio signal levels in a headphone amp are high enough for that to be an eminently manageable problem and we certainly found no worrying signs of it here. Otherwise, features are typical of the breed, with phono input and output and a single headphone jack. The circuit is a little unusual, using as it does an op-amp in conjunction with a single-ended Class A output stage using exactly one transistor per channel. Measured performance is excellent, the bandwidth going far beyond the audio range in both bass and treble, with low distortion into any normal headphone impedance and plentiful output. Output level isn't everything, but this amp impressed not least on account of its large audio scale. Indeed, even with quite modest volume-control settings the sound just seemed big and generous, tonally, dynamically and even spatially. Once again, there's a lot of detail, but the dominant impression is of size. Funnily enough, this was perhaps more pronounced with some unaccompanied solo vocals than with orchestra or mega-rock, but that just serves to remind one that the human voice can indeed be a very big instrument. Perhaps if you like your music a bit on the polite side this may seem a touch excessive, but we freely confess that we just loved it. Tonality is great too.